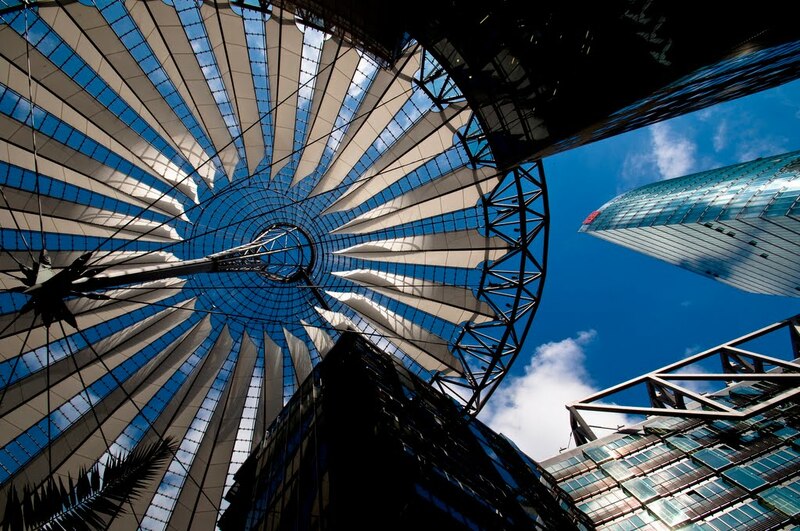 Berlin has always been a destination on our list of places we definitely want to visit while living in Europe. Since it is close, though, and relatively easy to get to, we've been putting it off. This month, we had the incentive we needed to finally plan the trip. Our friends, Josh and Mitch, were stopping by Berlin as part of their trip around the world (yes, literally around the world... wow!). We decided to meet up with them this weekend and explore the city together. For us, it is about a 7 hour train ride from Rotterdam. The trip went surprisingly fast, I think mostly because we were excited about getting there. Our hotel turned out to be in a great location, and was only 60 Euro a night (including a private bathroom). It was right next to the Kaiser Wilhelm Gedächtniskirche (Memorial Church). 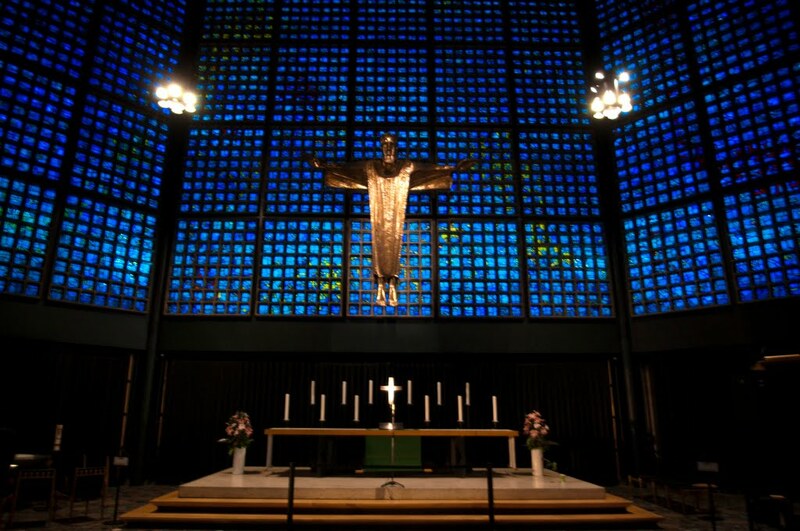 This church was bombed in WWII, and left in it's post-bombing state as a silent reminder of the impact of war. We could hear the church bells chiming from our hotel room. A memorial was built next to the church, with blue stained glass covering all of the walls. Our hotel was also on the southwest corner of the huge Tiergarten which is an expansive intercity park which larger than Central Park in NYC. In the center ring if the park, there is a golden statue of the goddess Victoria on top of a large pillar, which locals affectionately call 'chick on a stick.' Unfortunately she was under scaffolding, so we couldn't see it. We arrived in Berlin a day before the guys, so we explore the shops in our area and parts of the huge garden. We found a nice beer-garden hidden in the park. The back deck area overlooked a small lake, and was lined with the typical long wooden tables and benches, with white strings of lights strung between the trees, making for some cool ambiance. On Friday, we all put on our sightseeing caps and headed into the Mitte (middle) area of the city, formerly in East Berlin. 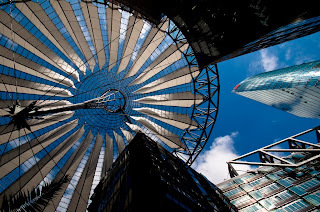 First, we headed to the Sony Center, which is a plaza in between several buildings that is covered with a modern glass ceiling. The ceiling is pointed in the center with large tarps hanging down, and resembles a circus tent, especially with the changing colors at night. 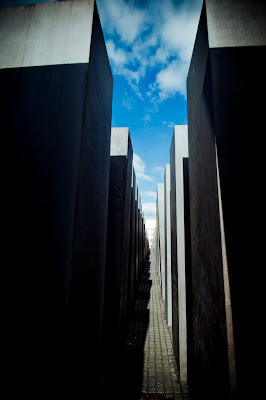 Nearby, we passed the Holocaust Memorial. 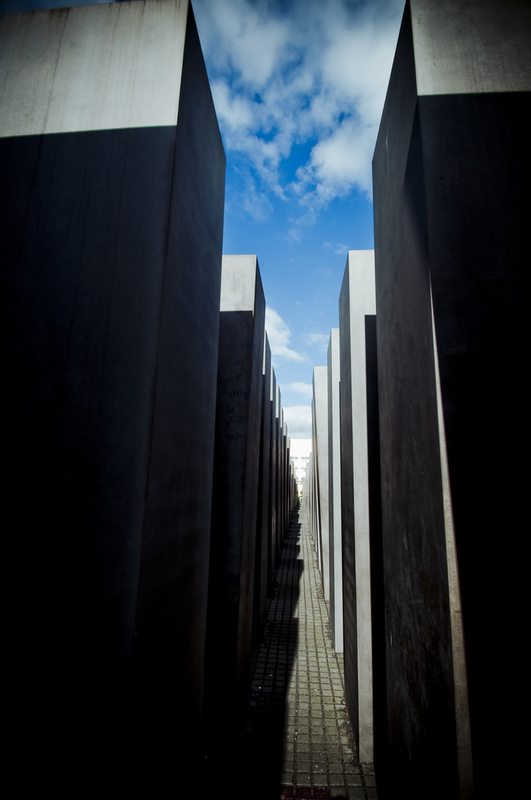 This was a very interesting memorial, consisting of hundreds of large, rectangular, cement pillars lined up in a perfect grid, but all with varying heights. The ground itself is sloped as you walk through the pillars, so you end up being submersed & surrounded by them. Underneath the entire area is a memorial museum, which was very impacting and sobering, and helped to put things in perspective and remind us of exactly what happened during the war. 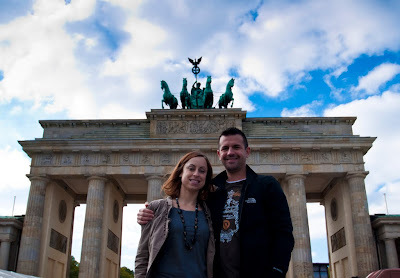 Walking further down the street we came upon the famous Brandenburg Gate. Since this happened to be the weekend of the 20th anniversary of the official reunification of East & West Berlin, they were having a huge festival, and the gate was surrounded by fences, a music stage, and various vendors. It is quite a large gate, and you can almost picture troops marching through the pillars. 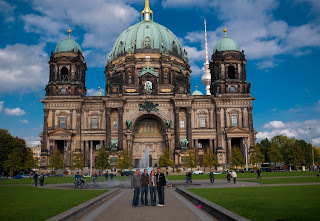 We walked up the famous street Under den Linden, and up to the Berlin Dom. It is a massive and beautiful cathedral. 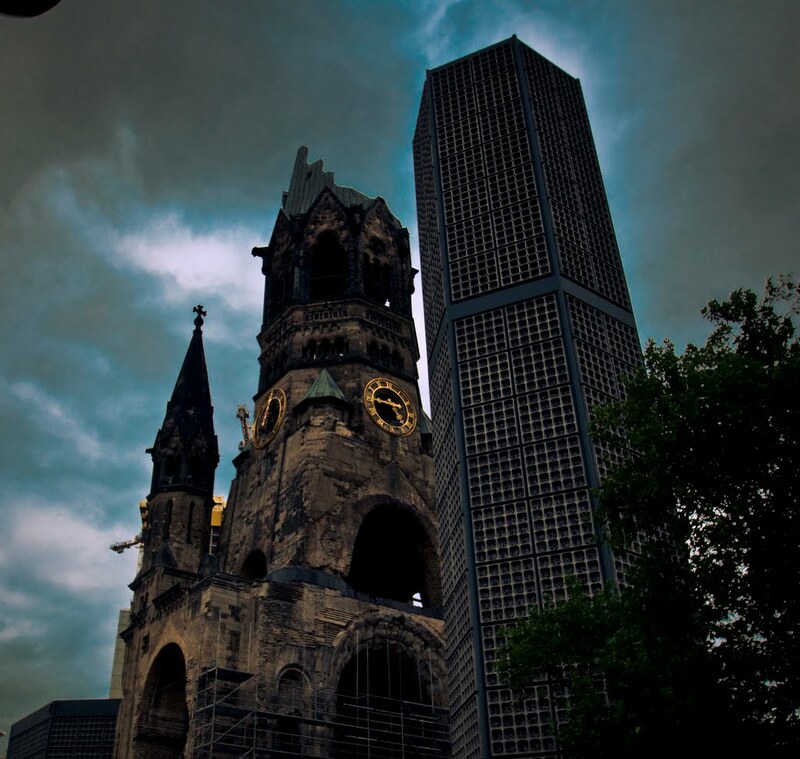 We went up in the top of the Dom, which provides a great 360 degree aerial view of Berlin. 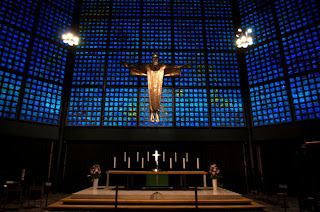 You can get an especially good view of the TV Tower, which shows a cross when sunlight hits it (a secret addition from the Swedish engineers who built it on commission by the 3rd Reich). We went to the Newton Bar, rated one of the best bars in all of Berlin. German-born photographer Helmut Newton's giant photos of naked ladies adorned an entire wall. It had nice comfy leather chairs, and a huge drink menu. Next we went to the Augustiner Brewery, where we had a couple Mass of Oktoberfest beer, pretzels, and crispy pork knuckle (Chad's dinner). This night was our epic adventure to find The Green Door. The whole journey to find the city's number one ranked bar is not worth explaining because it's sort of a 'you had to be there' moment. But to give a brief synopsis, we were originally turned away at the locked door by a large German lady that said, "No Way." To our pleasure, though, we were validated and granted entrance an hour later (after two 'courage' beers at the bar next door, haha). 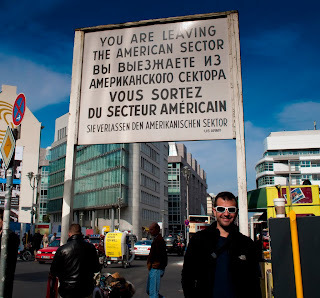 On Saturday, we went to see Checkpoint Charlie. 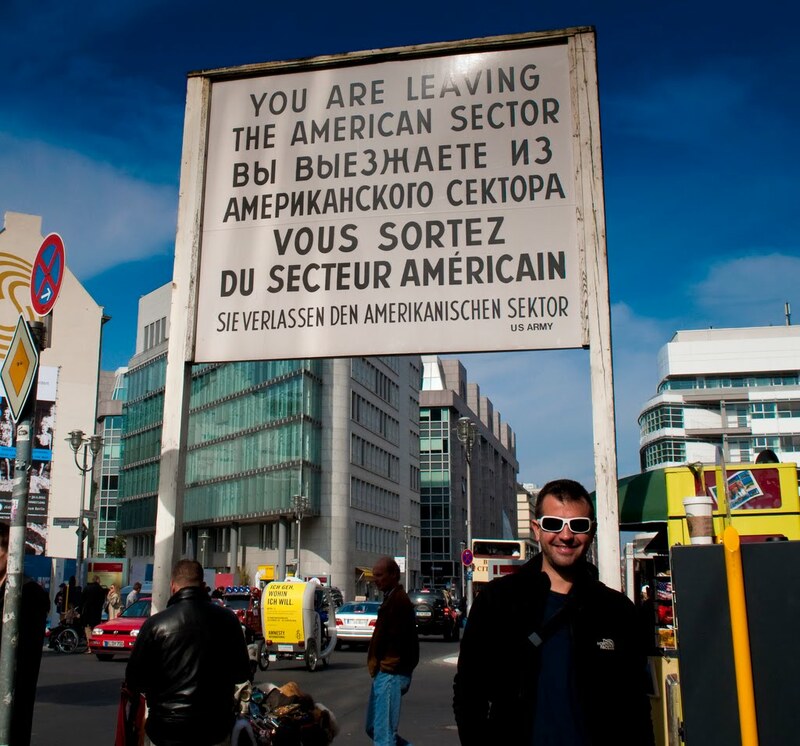 This was the border between the American and Soviet sectors of the city. There is still a little checkpoint booth in the middle of the road, and a large white sign that says "You are now leaving the American Sector," in English, Russian, French and German. We went in the museum there which gives details and shows actual articles from the wall, and all of the ways people tried to go through, under and over it. 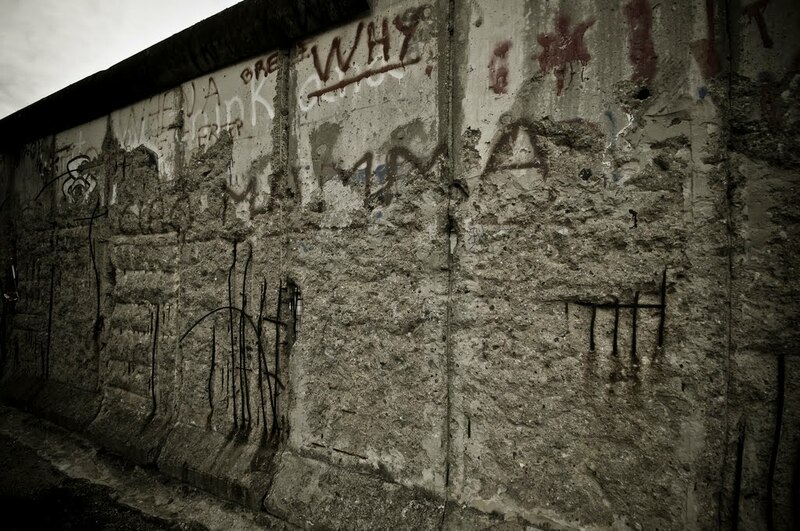 Nearby, we also saw a huge portion of The Wall that was on display. Everywhere you turn in this city, you are reminded of just how much history is around you. 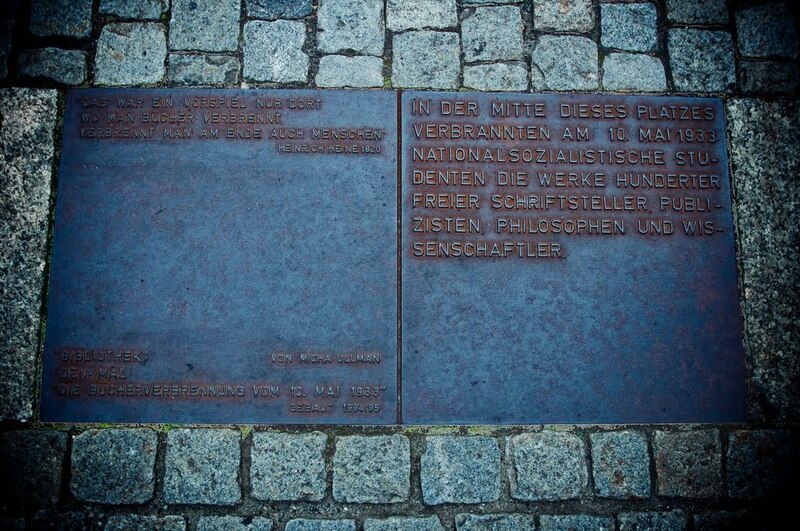 We walked to Bebelplatz, where the huge book burnings took place during WWII. On the ground in the middle of the plaza is a plaque that reads "Where books are burned, in the end people will burn." The most interesting part of this quote is that it is from 1820, more than 100 years before the Nazi regime. There is also a window down into a small room in the ground with four walls of empty white bookshelves. After wandering around the festival by the Brandenburg Gate for a bit, we headed out of the Mitte into the old East Berlin area. This was such a lovely neighborhood area with beautiful gilding on the houses, parks, and cafes & trees lining the streets. There are also quite a lot of old warehouses in this area, some formerly bombed out, that have now been converted into bars, clubs and restaurants. On Sunday morning, before we went to the train station, Chad and I managed to wake up early and head to the Reichtstag (had to be there before 8 am to beat the crowds from the tour buses). The building is a massive old stone government building where the German Parliament sits. After most of it burned during the war, it was renovated, and recently they added a huge glass dome on the top which overlooks the parliament. 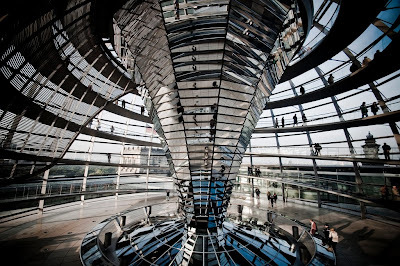 This dome symbolizes the transparency of the democratic government. We highly recommend Berlin to anyone considering a trip to Germany. We really had a great time this weekend, not only seeing this incredible city, but catching up with old friends. We did a ton of sightseeing, but we also spent a lot of time talking, laughed a ton, and retelling old stories, which is always great. It's nice to sharing experiences like this with good friends. Hopefully we'll be able to do more of this in our last year here. 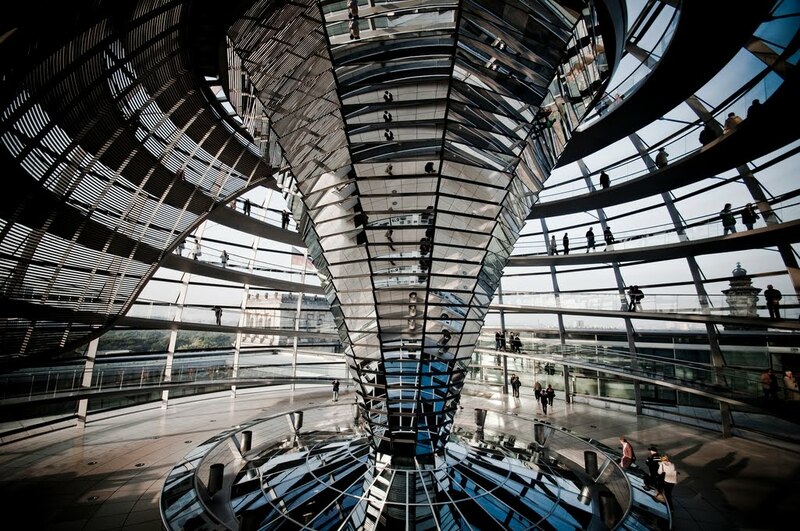 Oh yeah- we definitely need to go to Berlin ASAP now. It looked like y'all had a great time!